Because parental behaviour functions to influence the fitness of others (see Social evolution within the family), we have found that parents can drive evolutionary change (e.g. Feeney et al 2013, Kilner &amp; Langmore 2011, Langmore et al 2011). 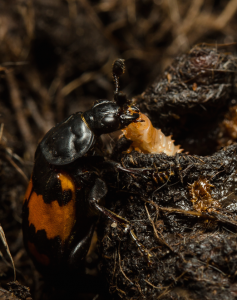 We applied the technique of experimental evolution to burying beetle families and showed that parents select adaptations in their offspring (Schrader et al 2015). Furthermore, our work suggests that the coadaptation of parent and offspring characters provides a mechanism for post-mating reproductive isolation, an early stage in the process of speciation. We showed experimentally that a mismatch in parent and offspring traits, which might arise in nature from hybrid pairings between diverging populations, results in reduced offspring fitness (Hinde et al 2010).